Castiel and Dean [6x20]. . 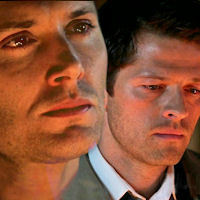 Images in the Castiel club tagged: castiel supernatural dean winchester the man who would be king 6x20. This Castiel icon contains बिजनेस सूट, चित्र, headshot, closeup, हेडशॉट, and क्लोज़अप. There might also be ऐडवोकेट, न्यायाधीश वकील, जज एडवोकेट, सूट, कपड़े का सूट, ड्रेस सूट, पूरी पोशाक, tailcoat, पूंछ कोट, पूंछ, सफेद टाई, सफेद टाई और पूंछ, पोशाक सूट, पूर्ण पोशाक, टेलकोट, पूँछ कोट, and पट.